A power rack is a necessity if you want to lift barbells but don’t have anyone to spot for you. Even the fittest and most experienced lifter can occasionally lose control or experience sudden muscle fatigue and has to quickly drop the weights. 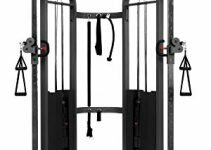 With a power rack that has safety catch spotters adjusted to the right positions, you can be reasonably confident of not having a mishap and focus on targeted exercise and a precise range of motion. You can always get a really good power rack to use at home if you have the budget for it. Some of the best come with additional accessories, like a lat pull down. However, if it’s not something you want to spend too much on, we’ll help you find the best power rack under $500. While this budget won’t help you become a champion weight lifter, you can expect good results if you’re just doing moderate body building. 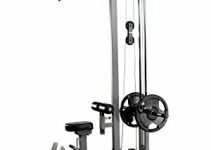 If you prefer doing strengthening work only using cables, then a dedicated lat pulldown machine will give you more options rather than just getting an attachment for a power rack. Before we review the top value power racks you should first be aware of the limitations you’ll come across as compared to more expensive models. Very often, the maximum weight capacity that you’ll find is no more than 700 lbs. If you want to do chin ups and pull ups, you must check the bar’s maximum capacity too, as these racks tend to be lighter and less stable, so they can tip over for very heavy people. Even for normal weights, you might want to anchor the cage to the floor just to be on the safe side. Sometimes a budget power rack won’t compromise on stability and quality construction but will leave off any additional accessories or give you the option to buy them as extras. If you don’t already have them in your gym, these extras can put the total price beyond $500. Another way to save money on building your home gym is to choose a squat rack instead of a power rack. It’s less expensive because it is less bulky. However, you should know what the benefits and compromises with both types are before you choose one. For that we have a guide to choosing between a squat rack and a power rack. All other considerations are similar to more expensive racks, so you can read about those and see which top of the line power ranks we picked as the best. But for now, let’s get to finding the best value power rack that costs less than $500. The best power rack for the money in the budget category is the Valor Fitness BD-7. In fact, we also rated it as one of the best power racks overall. Not only does it withstand a relatively high maximum weight of barbells but it also comes with a lat pull attachment and plate storage pegs, so it is excellent value for money. Since we have already reviewed it once, we won’t go into detail again. Suffice to say it is one of the most popular power racks on the market. Get the Valor Fitness BD-7 Power Rack with Lat Pull Attachment here. For effective training, you must be able to include as many workouts as possible. However, that is not possible when you have limited space inside the power rack or when you can’t add the tools you already have for certain sessions. However, with Titan Power Rack, you have the chance to perform lots of upper body workouts of your choice, from the military press, squats, bench press, shrugs, and curls. 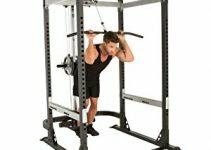 While there are no extra attachments with this simple power cage, it gives you enough space for side-to-side movement and you can get any weight bench in there, which allows you to include numerous exercises. The rack has 28 positions spaced 2.25″ apart to let you adjust the position of the spotter safety bars. The front ends of the bars extend to the outside of the front posts and bend downward to act as dip bars. The bars have a decent weight capacity of 700 lbs and there is a pair of J-hooks provided for use on the back posts, which you can install to face inwards or outwards. There is a pull-up bar at a height 80” and a 1 1/4″ diameter but there are no grips provided. The Titan Power Rack is designed to ensure that the user feels safe, with two weight holders at the back of each back post to balance out the cage when you’re doing pull ups. However, most users say they’re not really needed for stability but are useful for plate storage. Additionally, the unit is durable, thanks to the heavy-duty steel construction. Installation is easy and can be done in about an hour. Get the Titan Power Rack Squat Deadlift HD Lift Cage Bench Racks here. The Powerline power rack PPR200X is one of the first power cages designed for home use to give weightlifters the ability to do effective and safe workouts. Maybe it’s due to the years the company has been in the industry and the quality of the production, but it still is one of the most reliable pieces of equipment for home gym buyers and even some smaller commercial gyms where the user is not looking for lift extremely heavy weights. The unit is complete with 18 height positions with the topmost being at 68″. It has enough walk-in space that allows you to include multiple workouts. Other than that, it is designed for simple but effective exercises provided by 2 heat-tempered liftoffs and 2 saber-style safety rods. Whatever you want, from squats, calf raises, flat bench presses, incline presses, military presses and shrugs, are all possible with this cage as is. You also have a knurled pull up bar to accommodate regular and wide stance grips. For even more options, you can purchase the compatible PowerLine Lat Pull attachment and Bench. This set is affordable, made of durable steel, and comes with a 10-year frame warranty. Its maximum weight capacity is not very high at 600 lbs, but for most people that’s enough. Get the PowerLine PPR200X Power Rack here. The Rep Power Rack – PR-1000 has all the features you need to get safe and effective workouts at home. The inside space is convenient for different workouts, including squats, military presses, calf raises, and several others. It has 2” hole spacing that guarantees you comfortable and safe adjustments as you train. To make it easy to line up the safety bars and J-hooks correctly, every 5th hole features a numbered upright. Additionally, the power rack features 700 lbs barbell weight capacity, and it can accommodate up to 400 lbs users capacity on the dual pull up bars. One pull up bar is a standard 1.25 inch thick and the other is 2 inch thick for those looking for harder workouts that increase forearm strength and challenge your grip. The included pair of J-hooks are plastic coated to prevent bar knurling and the safety bars extend outwards to the front if you want to do presses outside the cage. You can buy extra J-hooks separately too. The rack has a pair of weight horns on the back, which provides easy access to weight plates and increases the stability of the cage when doing pull ups and dips. The dip station is not included, but you can buy it as an extra and it will handle up to 400 lbs of user weight. This rack comes with a 10-year warranty on the frame and assembly is simple. Get the Rep Power Rack – PR-1000 here. 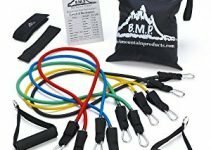 The Akonza Athletics Fitness Power Rack is a very new product on the market but its cost with additional accessories and good early reviews gives it a push onto this list. Its weight capacity is good at 700 lbs, but its walk-in space is a little bit on the low side, so very tall lifters might feel constrained in movement. But for others it is great for all the exercises you can perform. This is aided by the fact that it comes with several attachments to give you excellent value for money. There are two dip station handles on the front of the rack and these are separate adjusted for height from the squat rack safety bars that extend as safety catches to the front. Two more pairs of safety catches are there on the inside of the rack. Adjustment on all can be varied from 17.5″ to 68″ and between 17 positions. A knurled top bar is good for pull ups and chin ups. You also get a plate loading lat pull and a low row attachment. Four horizontal plate holders on the back posts allow for extra stability and easy access to your plates. Get the Akonza Athletics Fitness Power Rack with Lat Pull Attachment here.